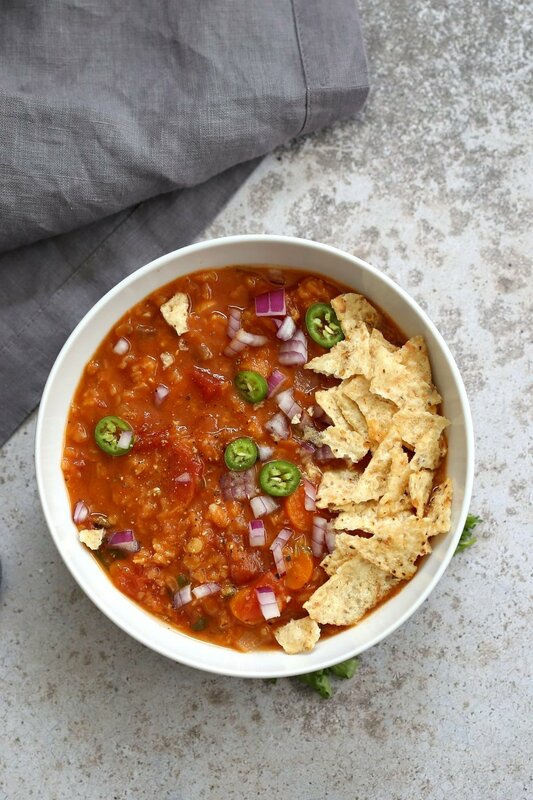 This easy 1 pot tortilla soup has red lentils, peppers, tomato, veggies that you want and a few spices. Put everything in a saucepan and simmer until done. 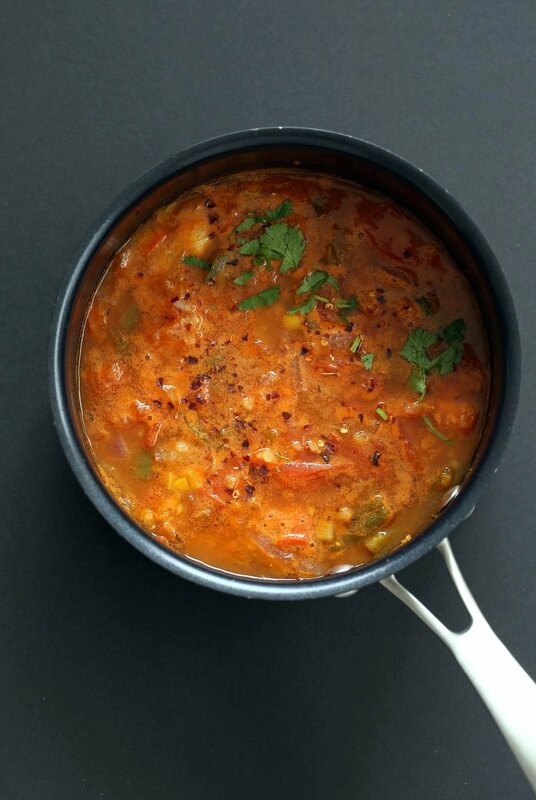 I like red lentils in this soup as they cook quicker and make for a lighter dinner. Beans can be an issue for some for dinner, and this works out perfectly. You can also add in some uncooked washed quinoa while simmering. Add veggies of choice and serve with garnishes of choice. See Video Below. Few ingredients, 1 pot, filling and quick. whats your favorite addition to tortilla soups? Serve this with 100% Whole Grain Dinner Rolls, Gluten-free Garlic rolls, tortilla strips or biscuits. If you make this simple soup, do tag me on Instagram! There are so many different lentils and names for them. Red Lentils come in various varieties. Red whole and unskinned lentils look brown and are called Indian brown or brown lentils, which take about 30 minutes to cook in a saucepan. When skinned, they are whole red lentils, called red lentils(! ), take about 18 to 22 minutes. These are not as easily available. When skinned and split, they are called red lentils or masoor dal, which are quick cooking (11 to 13 mins) and are easily available. I use the split red lentils in this tortilla soup. In recipes and shops the split and whole red lentils are often used interchangeably. There are many recipes on the blog that use red lentils by which I mean the split red lentils. Either will work here, the whole red lentils will just take a few minutes longer to cook. 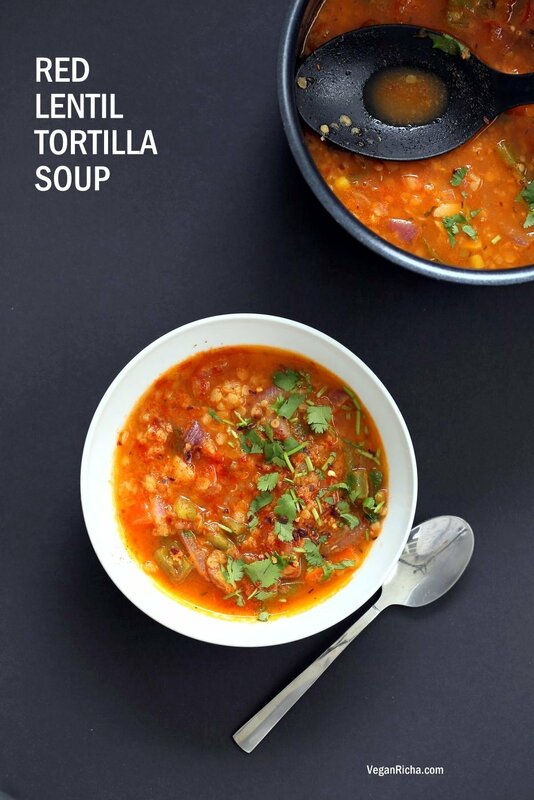 Easy Tortilla Soup with Red lentils. 1 Pot 30 minutes! Add veggies of choice, garnish with tortilla chips or avocado. Vegan Gluten-free Soy-free Nut-free Recipe. To double, double everything except water. Start with a bit less than double water/liquid. Heat oil in a saucepan over medium heat. Add onion and garlic and cook for 3 minutes Add jalapeno, bell peppers and mix and cook for 3 to 4 minutes. Add the spices and herbs and mix in. Add a pinch of allspice or loves for additional flavor if you wish. Add the washed and drained lentils and water and cook for 11 to 12 minutes or until al dente. Add the rest of the ingredients, mix well. Add other additions such as 1/2 cup corn or cooked black beans or other beans, veggies, some chopped up corn tortilla at this point. (I make the soup with or without beans , pictured without beans). Cook for 10 minutes or until desired consistency. Taste and adjust salt and heat. Add a dash of lime juice, garnish with chips, avocado, cilantro. See IP instructions in Notes. Instant Pot: Saute the onion, garlic, jalapeno and peppers for 5 minutes. Add the rest of the ingredients and a total of 2 cups of water. Close the lid on sealing and cook on manual for 3 minutes. Let the pressure release naturally. Taste and adjust, garnish and serve. Just wondering what makes this a tortilla soup? I forgot to mention Tortilla Chips in the garnish. Added now. I used some corn noodly strips instead for the pictures. Where is the tortillas? Its name is Lentil Tortilla Soup. The stars aligned today, I got all the ingredients and some time to cook (it doesn’t always happen, especially both at the same time) and made this. Easy, simple and delicious, as are many of your recipes. Just made this, and … wow! Delicious. Richa you are my favourite cook by a long way. Every recipe I have made of yours has been outstanding. Whenever my non-vegan family comes to visit I cook up something new of yours, and they are always bowled away. Indeed, they often say their favourite food is when they come to visit me. Needless to say, though, they wouldn’t consider becoming vegan for even a minute. Interesting logic. Anyhow, as I always say: let the world travel its path, and we will travel ours. Thank you, Richa, for all the inspiration, and the endlessly yummy food. Super easy and satisfying. I used poblano peppers instead of jalepenos and used chickpeas as my add in. Turned out really well! Amazing even using onion powder instead of onion. Added chick peas too! Yum! Huge hit with the whole family. I was just wondering how I was going to convert it to the Instant Pot when I saw your note at the bottom! Thank you! I can’t wait to try it! Richa, love your recipes! I will make this soup for this week. 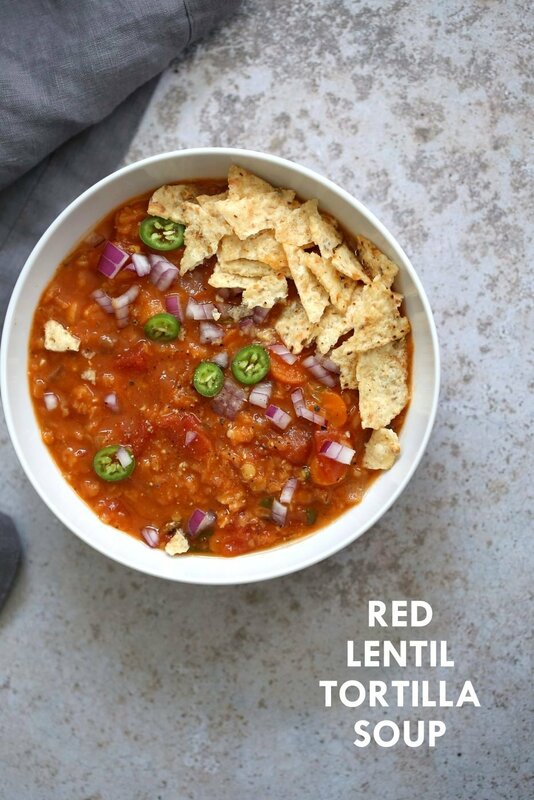 I was going to just make lentil veg soup then this one came up in my newsfeed and changed my mind! This was so tasty and easy, thank you! I used chipotle chilli with adobo in place of jalepinos and it was great! I make this soup regularly and it’s DIVINE! Thank you Richa ???? Absolutely delicious…warm, spicy, filling, and comforting! One word “amazing” thank you for sharing!! My 5 year old hates entire categories of food including soup and stirfry. He loved this though and requested that I make it tomorrow as well. We omitted the jalepeno and cayenne to make it more kid friendly. Great, quick recipe. I’m new to using an Instant Pot, and I’m a little confused by the note. It says to add a total of 2 cups of water or broth. Is that in addition to the 2.5-3 cups water/broth already in the recipe? Thanks! Another winner in our house. Your recipes are quickly becoming our favorite! Your spice combinations are spot on. I don’t have an instapot. Could this be made in a slow cooker? Simple, filling and quick. From prep to table in about 30 minutes with the Instant Pot. We were out of jalapeños so I substituted a few Thai chilies and a small can of diced green chilies and it had a nice heat to it. I have made this recipe so many times, without any oil or tortilla chips. I don’t bother with the amounts listed here, I always double it and eat it for a couple of meals. So yummy and easy. My whole family loved it. Thank you for a great recipe!